Cadre Jason instructed us to get in the water before I ever even saw his face. I didn't want to overheat, and had made the decision to take off my level 5 softshell once we got started because standing around in the wind was pretty chilly, but I never got the chance. Me on the left and my good buddy Deric before the beginning of the challenge. We were wet and sandy for the entire challenge. We endured temperatures ranging from 5.8°C at night to 17.0°C in the afternoon so having a modular clothing system where I could take on or take off layers was very important. The Protective Combat Uniform (PCU), is supposed to allow you to jump in a lake and run yourself dry in about an hour (too bad nothing like that exists for feet!). 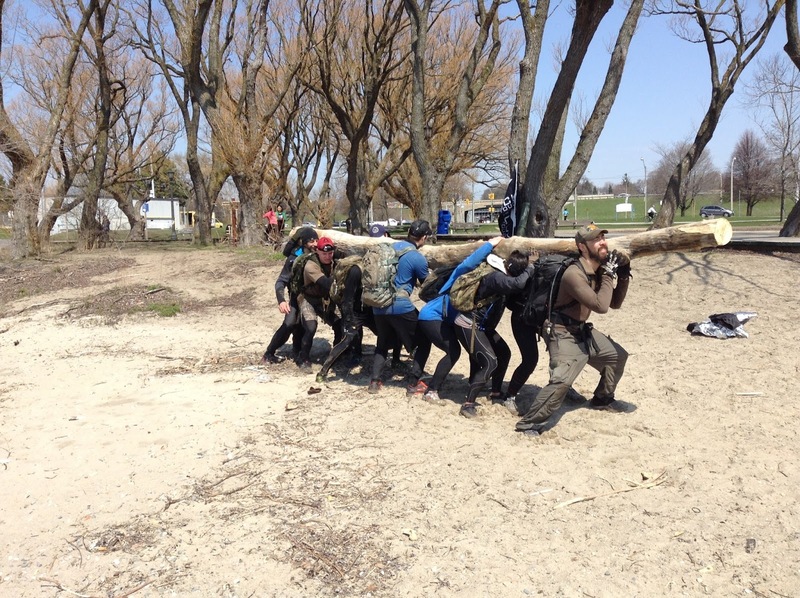 Throughout the challenge we ended up in The Don River, some leech filled creek in High Park, and Lake Ontario. Lake Ontario was by far the worst of the three. We all had body shakes and were showing the first symptoms of hypothermia, but my clothing choices allowed me to return to normal relatively quickly. During the night, I wore my softshell, grid fleece and base layer. If I were to do it all again, and the conditions were the same, I wouldn't change a thing. 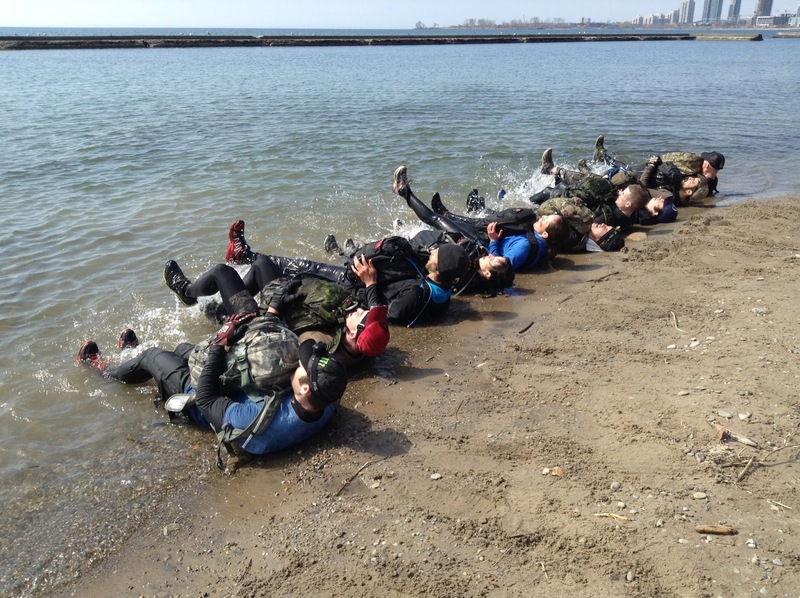 A few hours after the sun came up, I took off the softshell, and was relatively comfortable even after doing full submersion in Lake Ontario twice. When it got closer to noon, I took the fleece off and finished the challenge in my base layer. I would have been pretty uncomfortable had I been stuck without layering options. As well having a pack big enough to allow me to dump my layers was a big one too. 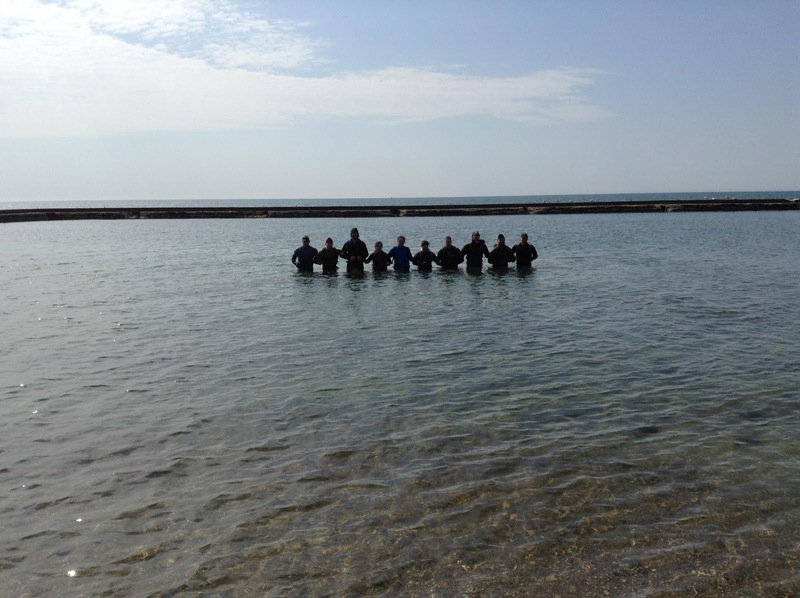 The idea of going into pretty much any body of water around Toronto is not something most Torontonians would ever consider. So sucking on the mouthpiece of your hydration tube after it's been dunked has got to be one of the worst things I could imagine. Hydrating is obviously not something you can skip. Luckily my Camelbak HAWG came with a mouth piece shield that fit onto my MSR tube. It was by no means water tight, but it kept 99% of the sand and other crap away from my mouth piece. This might have been mostly psychological, but after dunking yourself in The Don, and smelling the smells, you'll take any protection you can get. After watching some videos on YouTube of some other GoRuck classes, I had my doubts that a regular water bladder would be able to withstand such a beating. Luckily I already had an MSR 2L Dromedary bladder that's made with Cordura. 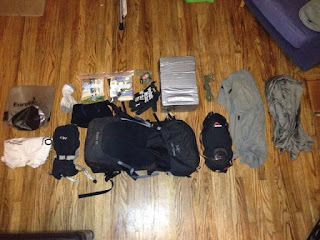 I've brought it camping a number of times, and it's nice to not worry about babying any of your gear. It's built tough enough to carry boiling water, and took some pretty serious abuse sitting beside my bricks during the challenge. I'm feeling even better going into this summer season of camping that my saké bladder is good to go for pretty much anything. Mud and sand seeped into my shoes and socks the first time we got into The Don River. More PT, more water. I thought back to when I did the OXFAM 100km Trailwalker event, and how I would take off my shoes and socks at every checkpoint to ensure my feet were always properly moleskinned, dry and clean. I laughed to myself because it was painfully clear this was a completely different beast. I was wishing that I had put on my waterproof socks before everything had gotten started because we were on the move again and I couldn't feel the inside of my sock, I could only feel wet sand. In the end, although my feet had been wet for the entire fourteen hours, I was surprised I didn't have any blisters. Not even a hot spot. How I escaped unscathed is a complete mystery to me. The only thing I can think of is that since my feet were wet it reduced the amount of friction between my feet and the ridiculous amount of sand I had in my socks. As well, the water helped keep my feet a bit cooler. Looking back, my feet were never in pain. All the sand and water was annoying, but I'll take annoying for a week rather than a day with blisters. To be able to complete the challenge without thinking too much about my feet was a pretty amazing. One of my biggest mistakes was not wearing a belt with my softshell pants. I've never used a belt with them as I've never needed one. What I learned very quickly though, was that water and sand effectively make velcro useless. So the velcro side adjustments on the pants and the straps on my gloves just flapped around and stuck to nothing. There was no way I was going to ask Jason to stop so I could fix or pull up my pants. During the first break, only 10 minutes I think, I pulled out my 550 paracord and made a belt. I laughed to myself and thought about and old Simpsons episode where Jimbo used an extension cord as a belt, but that smile was quickly wiped off my face as we spent the next half hour or so running up and down the ravine. Fourteen hours running around with a ruck with bricks on it is going to take a toll on whatever it touches. I had wrapped my bricks up with duct tape, but with friction and water, the edges started to curl. Over time the brick was exposed and it shredded the inside of my pack. 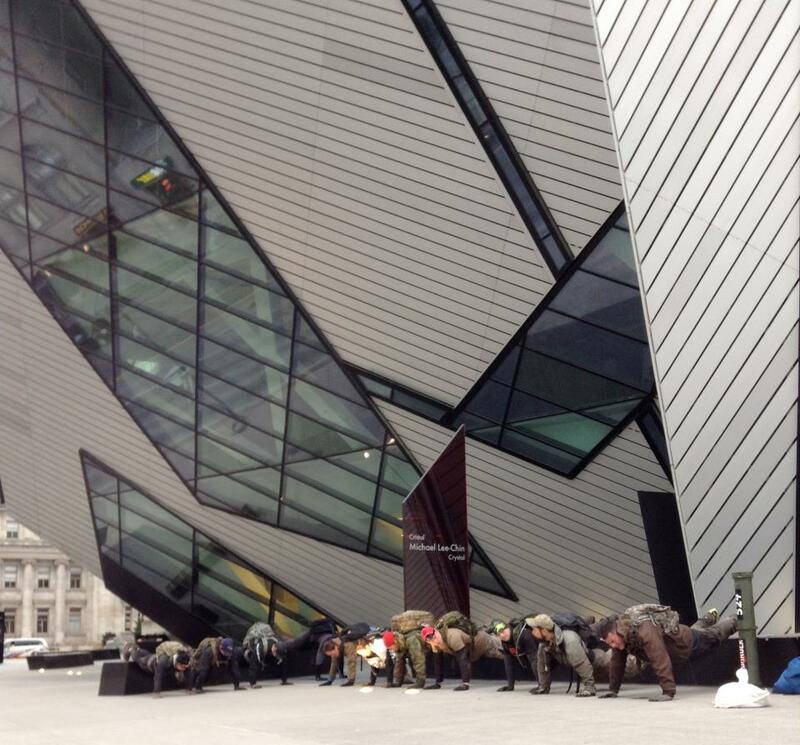 I should have kept them all in a cheap dry bag. 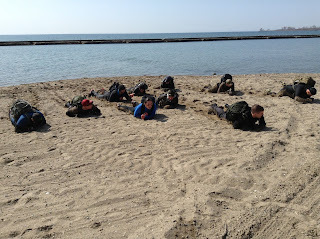 GoRuck is hard. Don't make it harder than it needs to be. I was scared that when cadre did the brick inspection at the beginning of the challenge, I'd be laughed at or punished for having bricks that were lighter than everyone else's. So I went out and bought the heaviest bricks I could find. Jason looked at my bricks for all of .5 seconds during inspection and we were on our way. 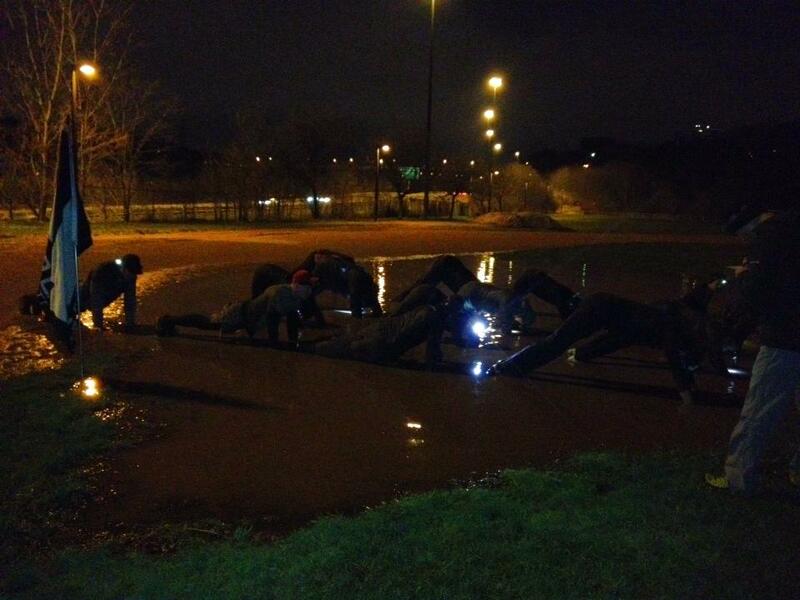 Who knows what the other cadre do, but I think as long as you have the right amount of bricks within the required weight, you're going to be ok.
Part of me thought that we'd get wet after doing a few hours of PT and then that'd be the end of it. I thought I'd be able to change out of my wet clothes and socks, and then get into some dry clothes. Man was I ever wrong. Delusional isn't much of a hyperbole actually. I could have done without my dry bag and extra change of clothes, wind shirt and mitts. Sealskinz socks were probably unnecessary too as I never had a chance to wash my feet, so putting sandy feet into dry socks would have more harm than good. 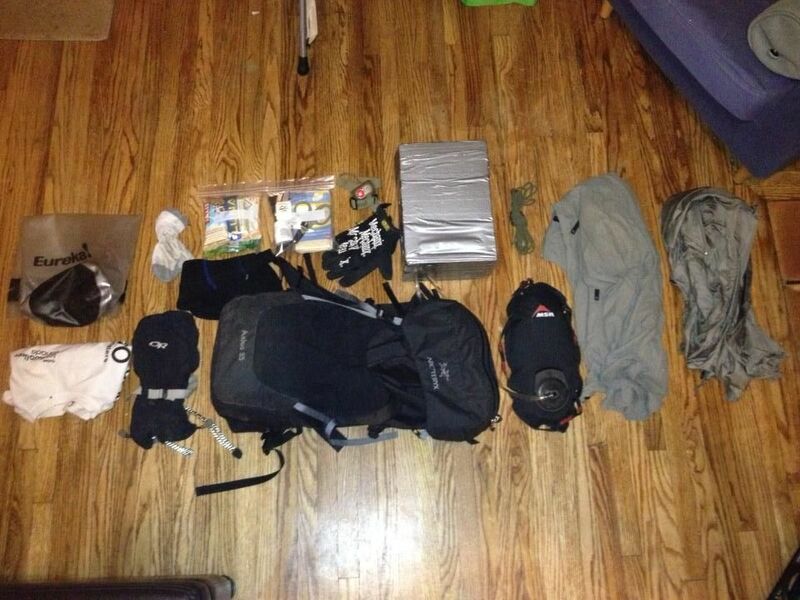 When I decide to do GoRuck again, I imagine I could probably carry closer to 40lbs rather than 50lbs by choosing slightly lighter bricks and choosing not to bring extra clothes. 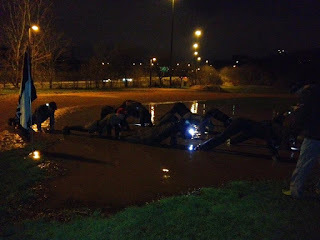 Our first taste of GoRuck was... wet. 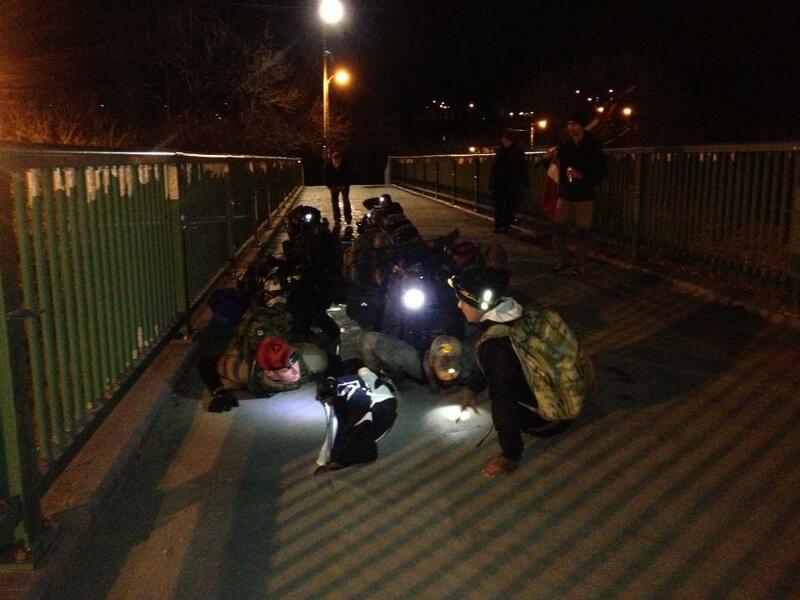 Beyond Tactical's Level 5 Softshell was dragged across a cement bridge. No scuffs, rips or holes! Mechanix Gloves kept my hands from getting ripped up. We did a lot of pushups, bear crawls and wheelbarrows. Sekri's PCU Level 2 grid fleece was quick drying, and kept me relatively warm. Stoney's team weight was amazing. Mostly because it was filled with beer. 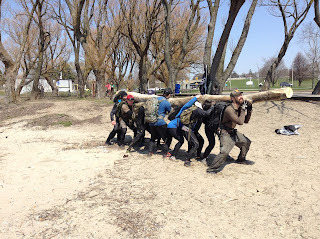 The hardest thing about GoRuck wasn't signing up like I had read somewhere. It will push you, and will make you question why you are punishing yourself. I don't go to the gym, and I don't do crossfit. I to take study martial arts, but these days it's at a very casual once per week thing. 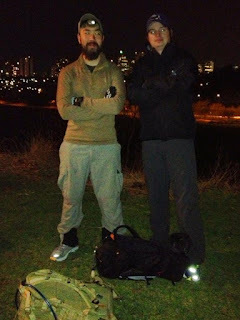 What got me through GoRuck was a combination of pride, positive attitude, and a reasonable level of fitness. First and foremost, I did the challenge for myself. I wanted to push my body and mind, and training for the event was a great way to keep my diet and exercise in check. 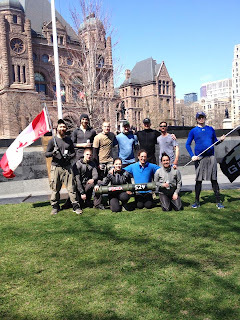 As well, I told EVERYONE I was doing GoRuck. Going home without that patch was not an option. When I first found out about the challenge a coworker flat out told me I couldn't do it and laughed after we watched the promo video on YouTube. Proving him wrong was a hell of a motivator. That being said, once you get going in the challenge you'll find very quickly that acting as an individual will get you nowhere. Check your ego at the door and work with your class, not in front of them. As cheesy as this is going to sound, read Lone Survivor by Marcus Luttrell, and go watch some BUD/s and SF selection videos on YouTube. If I learned anything from those examples is that there are people that know they are going to finish, and there are people that are unsure. Never let quitting enter your mind. Don't let it be an option. Jason told us that he had better not see a watch on us, so I hid mine in my pocket. He was totally doing us a favour. When you're tired, wet and hurting, and you look at your watch and you're only 30 minutes into the challenge, your will is going to take a massive blow. Manage your expectations and accept that it's going to be long. Instead of wondering if your next checkpoint will be the finish line, concentrate on doing everything you can to simply get there. If you expect that your next checkpoint is your last, then you find out your next checkpoint is 10km away, you're going to be crushed. I am amazing about your well written articles have inspires me a lot of- really gives me an insight on this topic.Here you can find more relative information if you have time please visit gym attire.